Where can I find list of API’s? List of available API’s are available on WordPress A-Z list of API’s. A link to API Portal or third party websites is provided from the A-Z list where the description, technical details and mock examples of these API’s can be found. How to access API Portal? API Portal can be accessed using API Portal and based on your access levels you can either see Public & Private API’s or just Public API’s. What is the current Mule run time version being used? Where can I find downloadable of Anypoint studio? How do I setup development environment using Anypoint studio? Please refer to the above link for basic setup. Where can we find API end points? API End points are available in exchange section of API portal for each API. It also includes API details like input, output along with examples. How to request Access to API’s? Functional Process – Fill out the Approval Form Link by selecting the required data elements needed and submit for Approval. Technical Process – Refer to Technical Process Link for technical registration process. The technical step of obtaining client_id and secret will be approved only if the Functional Process is approved. Token generation process – Follow the steps to get the token Token Generation Process Link, once token is obtained access the API by passing the token. Who has access to submit the API Access form? Access to form is enabled through SSO in service now, starting May 1st week all in NYU should be able to access the form. Are there any time lines around API services ? ARB Approved – API Access Request 2 Weeks Assuming any concerns Approves have are clarified. Overall API provisioning ( End to End) 6 to 7 weeks Assuming all above activities are initiated in parallel. Are there any best practices around building API’s? Please refer to API Best Process Link for best practices around API’s. What are good testing tools for testing API’s? Where do we store API source code? All API’s source code to be deployed on to mule soft will be stored in Gitlab which is integrated with Jenkins to do a continuous Integration and deployment. What is the process for production deployment? Foundational API’s are system level API’s, the usage of which is designed for multiple applications to consume the data as is or use with other Foundational API’s. One to Many integrations. Integration API’s are API’s which are built as per the business needs of one particular application. These are point to point integrations and in most cases cannot be used for other integrations. Should we request an API to integrate between two products? API first is the strategy followed but API’s should be created between two products if they are expected to be reusable and if the 2 products are enterprise level products. When to request an API? 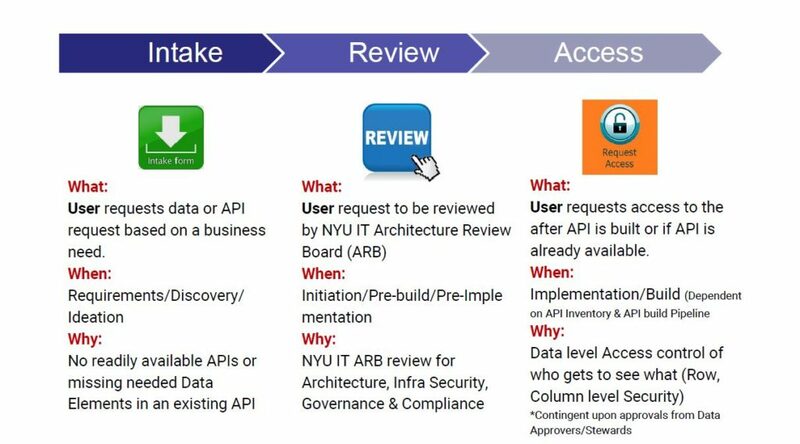 Refer to the data governance process. Who can test in a sandbox environment? Mock API’s available through Mulesoft Portal can be tested by all. Developers building the API’s can test their API’s after deploying to Sandbox. Once API access is approved, use postman to test in Production.